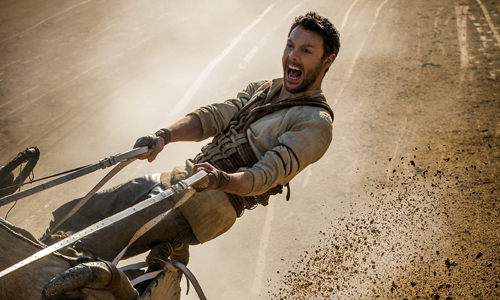 Timur Bekmambetov's new cinematic vision for Ben-Hur was confronted with pessimism right out of the starting gate, emerging as yet another remake from the Hollywood machine that seemed to fall squarely into the "unnecessary" spectrum. Naturally, part of that comes from the iconic legacy of William Wyler's magnum opus from the late-‘50s: an adaptation of General Lew Wallace's epic story of revenge and religion that continues to stir audiences over half a century later, one that transcends its faith-based intentions with a certain depth of human drama and grand spectacles of action. One shouldn't forget, of course, that Wyler's film was also a remake, though the transition to color cinematography and full sound gave his take on the material -- emerging in the same climate as Cecil B. DeMille's The Ten Commandments and other high-dollar epics -- some reasoning for its creation. Bekmambetov's iteration of Ben-Hur doesn't have that justification, nor does its dull and messy execution provide any of its own. Covering the general plot points of Ben-Hur without describing how it gets across the finish line can be difficult to do, largely because the more meaningful courses taken by the drama emerge later in the story, that of a wealthy prince in Jerusalem named Judah Ben-Hur (Jack Huston). This version begins where it ultimately ends: a depiction of the iconic chariot race sequence that serves as a framing device for the sprawling journey of Judah and his close friend and adoptive brother, Messala (Toby Kebbell), whose clashes of personal beliefs force the once-close pairing to become political and philosophical rivals. Over several years, the story charts how their ideology forms from their experiences, revolving around religious zealots, Rome's militaristic oppression, and how aristocrats like Judah and his family fit, and should fit, into the equation. Through many challenges, from near-death experiences to criminal charges of attempted assassination and imprisonment, Judah focus his determination, vengeance, and evolving faith onto the injustice of the Romans. Director Bekmambetov previously stated that his version of Ben-Hur is "a completely different movie" than Wyler's classic, something clearly and quickly observed in the chain of events that begin Judah's saga, transitioning from the dusty spectacle of chariots into a quaint horserace between young men. From a script penned by The Way Back's Keith Clark that was reworked by 12 Years a Slave's John Ridley, the catalyst that begins the conflict between Judah and Messala starts things off on the wrong foot, forcing heavy-handed alienation between the "brothers" through overblown responses to an incident. Ben-Hur never fully recovers from these adjustments, even though they plant the seeds for this new version's expanded focus on having mercy upon others for their past transgressions. Their emergent personalities must constantly shoulder the burden of the script's simplified and blatant formation of their rift, undercutting their individual depths while highlighting their unconvincing bond as "brothers". Spurred by a genuine yet nondescript performance from Jack Huston, the thematic path taken in Ben-Hur produces a lethargic and uninvolving voyage through biblical Roman authoritarianism, one that regularly evokes the personal, family-centered revenge dramatics found in Ridley Scott's Gladiator. Director Bekmambetov goes through the motions in his depiction of Judah's transformation from wary aristocrat to weathered vengeance-seeker, providing him with enough superficial motivation to rationalize his actions without diving into the nuances that'd empower his charge against the legionnaires. Much of this hinges on the film's jumbled, sporadic relationship with religion and how it intersects with the story of Jesus Christ (Rodrigo Santoro) uncertain of how to carefully portray Judah's spiritual awakening and hunger for retribution while also periodically shining a light on the religious figure, his followers and teachings. Unremarkable supporting performances leave these historical theatrics, along with crisscrossing romantic pursuits and surrogate-family melodrama, in a stale and forgettable state. Timur Bekmambetov isn't renowned for his skill with character drama, though, but for his crafty visual flair and relentless energy in action sequences, who specializes in elevating the outlandish into a feast for the eyes. He only has a handful of moments to shine like this in Ben-Hur, and if anything, the pair of iconic sequences that would appropriately utilize his talents are, in fact, weakened by the director's overstated design, marred by inauthentic computer-generated effects -- boat collisions and chariot crashes alike -- and a sophomoric perspective on high-energy activity. Not even the fraught glances and scrambling of Morgan Freeman as gambler/chariot owner Ilederim can distract from the ridiculousness of this revamped take on the iconic horse-drawn spectacle that hallmarked the original, yet it's the kind of irrational action that obeys reality just enough to invite one to try and continue taking it seriously until its expected outcome. Ben-Hur may've not deserved such vehement opposition sight unseen, but the way it ultimately crashed and burned proves that there was something to all the lack of faith in the deadweight of this visually ornate remake.